Glare is a visual sensation caused by excessive and uncontrolled brightness produced by intraocular light scatter or straylight (Aslam et al. 2007). As a consequence of this light scatter, the contrast of the retinal image is reduced and thus common daily tasks, such as driving or reading, are significantly compromised. We have developed a new glare system called Luminare which can be used in the laboratory or clinic to detect early signs of cataract or to measure unwanted glare following refractive surgery. Keywords: glare, contrast sensitivity function, CSF, visual acuity, light scatter, cataract, refractive surgery, straylight. Glare is a visual sensation caused by excessive and uncontrolled brightness produced by intraocular light scatter or straylight (Aslam et al. 2007). There are different types of glare, but the one that has attracted more attention in the clinical field is disability glare. Disability glare is the loss of retinal image contrast which can cause serious visual impairment during common daily tasks, such as driving under the blinding effect of a low sun or oncoming headlights. In these cases, the driver’s ability of distinguishing low-contrast objects, such as obstacles or pedestrians, is severely affected by the scattered light. Why measure visual function under the effect of glare? Measurements of visual function in the presence of a glare source are often more informative than standard measurements carried out in the absence of a glare source. For example, visual acuity and contrast sensitivity measured in the absence of a glare source are unaffected in eyes showing early signs of cataracts. Testing visual function under glare conditions is also very informative when characterising unwanted visual glare produced by refractive surgery. How can I measure the effect of glare on visual function? 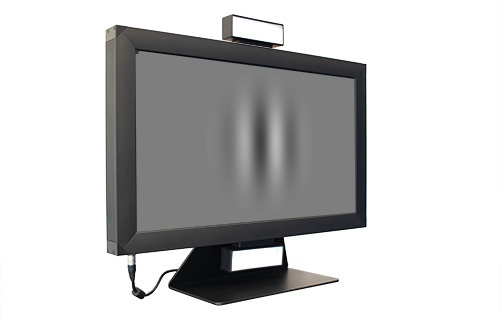 Disability glare can be measured in the laboratory or clinic by presenting calibrated images to the patient in the presence of a glare source. 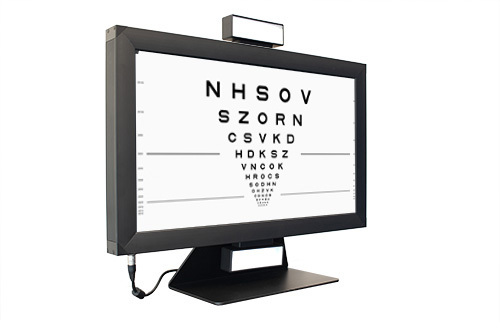 Traditionally these calibrated images consist of the visual acuity charts, the Pelli-Robson charts or grating patterns. How can I measure visual function under the effect of glare with Metropsis? The Metropsis system offers a ready-to-run solution to measure visual function under the effect of glare. This solution combines together Metropsis and Luminare. The latter consists of a pair of intense white LED sources placed above and below the calibrated CRS Display++ LCD monitor as shown in Figure 1. Figure 1. Metropsis with Luminare glare source above and below the display. Luminare is directly controlled by the Metropsis system and switches on when the visual tests begin. Disability glare is typically quantified by calculating the difference in visual performance measured without the glare, and then with the external glare source. The psychophysical tests typically used to assess visual performance are visual acuity and contrast sensitivity. These tests can be run at different light levels, such as mesopic or photopic. The Metropsis visual acuity and contrast sensitivity tests with the Luminare glare source have been designed to comply with the functional requirements of ANSI standard Z80.12.-2007 (R2017) for Multifocal Intraocular Lenses. Why is Luminare better than other commercially available glare sources? It is not easy to measure disability glare (Aslam et al. 2007) especially in young and healthy individuals (Maniglia et al. 2018). The difficulty consists primarily in finding the appropriate angle to position the glare source and in determining its intensity range. An unsuitable choice of the above parameters could produce unwanted afterimages, increasing or decreasing the visual sensitivity beyond the required levels. Metropsis, with Luminare, is able to measure a clear attenuation of the overall contrast sensitivity function under glare conditions, which is particularly pronounced at 6 cpd. This result satisfies the functional requirements of ANSI Z80.12-2007 (R2017), which states that the CSF attenuation with glare needs to be of at least 0.1 log units at 6 cpd. Luminare is an integral part of the Metropsis system, and thus is provided with fast and ready-to-run psychophysical tests that can be conducted at photopic and/or mesopic light levels. One of the core features of Metropsis is the ability to customise the psychophysical tests further or create new ones. This means that Luminare could also be used during the assessment of other visual functions, such as colour vision, stereo acuity, or novel tests developed to investigate more specific experimental hypothesis. Aslam T., Haider D., and Murray I.J. (2007). Principles of disability glare measurement: an ophthalmological perspective. Acta Ophthalmol. Scand. 2007: 85: 354–360. Maniglia M., Thurman S.M., Seitz A.R., Davey P.G., (2018). Contrast sensitivity measurements of young healthy individuals under photopic and mesopic vision. Front Psychol. 9:899.